A team of academics, led by the University of Bristol, are hoping to raise awareness of a unique, but little-known, medieval fresco which depicts fighting knights on the wall of a village church in Shropshire. 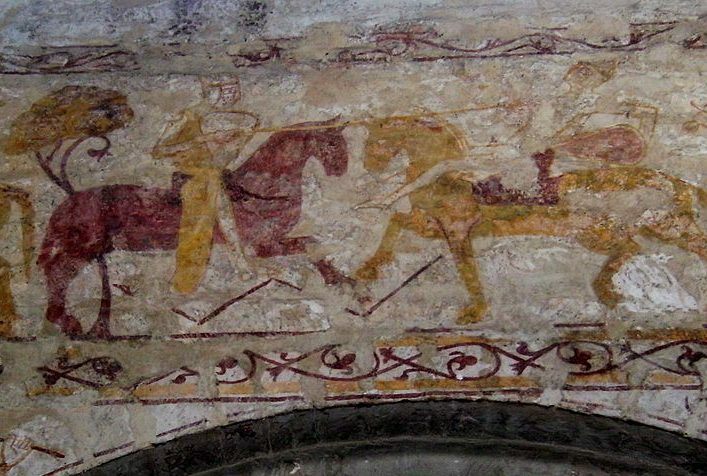 The painting, on the north side of the nave of All Saints Church in Claverley, described as England’s Bayeux Tapestry, is thought to date back to the 13th century and is the only one of its kind to be found in an English church. In 2012, historians studying the painting spotted several clues that led them to believe that the artwork depicted a scene from the oldest surviving major work of French literature, The Song of Roland (written between around 1100), which recounts the Battle of Roncevaux Pass. Roland was the nephew of the famous Charlemagne, King of the Franks, who ruled from 768-814 AD. On Saturday 21 July, a celebration of the painting will take place at All Saints Church from 7pm where academics will discuss the fresco and its possible meanings and interpretations, in relation to the Charlemagne legend. Dr Marianne Ailes, Senior Lecturer in French from the School of Modern Languages at the University of Bristol, is one of the academics speaking at the event. One of the more recent theories about the painting is that it acted an early form of medieval propaganda – to try an encourage people to support and donate towards the Crusades. Dr Ailes added: “Although historically Charlemagne had initially gone into Spain to support a Muslim leader, by the late 11th and early 12 centuries this has been transformed, probably by oral tradition, into a narrative of Christian versus Muslim. Dr Ailes will be joined at the talk by Matthew Strickland from the University of Glasgow, Phillipa Hardman from the University of Reading, military historian Matthew Bennett and artist Christopher Barrett. Tickets are free and available on the door. For more information contact charlemagne-icon@bristol.ac.uk.